3, 2, 1…A Year of Joy! May Christmas blessings continue to abound for you and your family during the octave celebration of The Day! 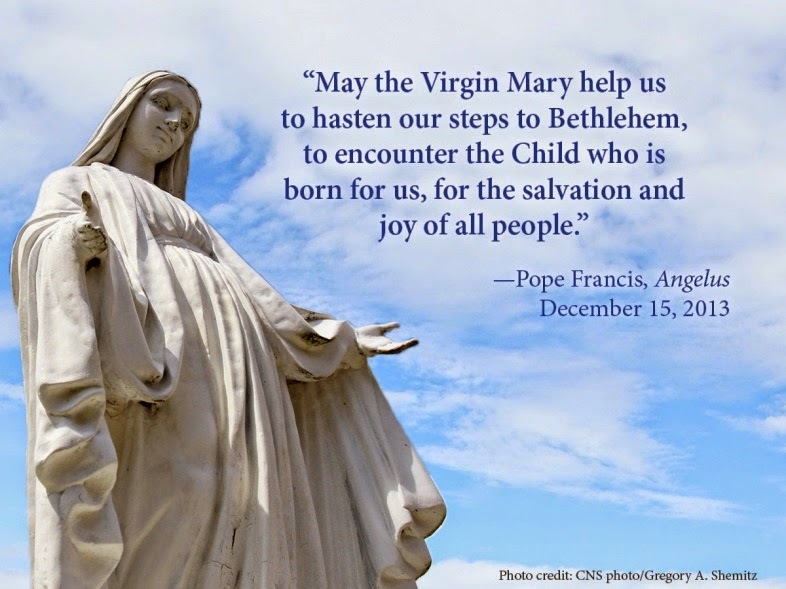 The countdown continues as we look forward to reading Pope Francis’ Evangelii Gaudium--one paragraph per day, staring on January 1st :) Pondering the mystery of God-with-us, let's join the Holy Father and echo St. Paul during the New Year: “Rejoice in the Lord always. I shall say it again: rejoice!” (Phil 4:4). And let’s invite others to explore Pope Francis’ vision for discipleship and evangelization in The Joy of the Gospel. As we await the celebration of the birth of our Lord, we also look forward to our journey into The Joy of the Gospel: It is less than ten days until we begin “following Francis”—one paragraph at a time! If you’ve already subscribed and want to make your commitment more secure, consider inviting a friend to join you. Whether it is about conversational possibilities (“So, what did you think about today’s paragraph?”), or about basic accountability (“Did you read your paragraph today? !”), practicing the “art of accompaniment” is always a good thing (cf. EG, n. 169). Forward it or Post it; Pin it or Tweet it: Remember, joy is both contagious and communicable! 5) A paragraph per day will keep “he-who-shall-not-be-named” away. 4) Joy is never overrated or outdated. 3) Pope Francis has shared some of his deepest hopes and dreams in this text, and he humbly offers them for our reflection. 2) The world could use a little more joy. 1) Jesus wants us to share in his joy, so our joy might be complete (Jn 15:11)! Are you ready for a little more joy in your life? Thank you for considering this invitation to (re)read Pope Francis' The Joy of the Gospel in 2015! Maybe you don't have time to take on all 288 paragraphs in one sitting, but here's an opportunity to join with others around the country to receive one paragraph per day of Evangelii Gaudium, from January through October of 2015. Call it a Christmas present to yourself. Make it your New Year's resolution. Or consider it an act of solidarity with Pope Francis, who is a walking witness to joy. After all, he wrote Evangelii Gauidum in a very personal way--for you and for me. In a recent interview, Pope Francis addressed those who have raised questions "what he really thinks," and he referred to this document as follows: "That's what I think, not what the media says I think. Check it out it's very clear. Evangelii Gaudium is very clear." Very clear, indeed. Very readable as well. And it is certainly very relevant to our daily journey of missionary discipleship. If you haven’t already done so, simply enter your email address in the "Follow by Email". This will set you up to receive one paragraph per day, starting on January 1st. Satisfaction of mind, heart and soul is guaranteed. Finally, spread the word about AJoyWhichIsShared.org by forwarding this link to friends and family. Post it, pin it, or tweet it to your followers. Join scores of other friends of Francis, as we reflect with him on Jesus' stunning proclamation: "I have told you this so that my joy may be in you and your joy may be complete" (Jn 15:11)! “A Joy Which Is Shared,” indeed: Our Lady of Guadalupe, Star of the New Evangelization, pray for us!